I finally got tired of the fraud in the banking business and ended up hating the banking system. I got into it after the savings and loan scandal and wanted to make a difference. Good to see there are others still fighting the good fight. Though it all I went bankrupt waiting for my money and lost clients because I would not hit requested values. Eventually went into court work on commercial projects but was only certified residential but due to my experience and professional reports I was always accepted as an expert witness and faced off in court with Certified General and MAI Appraisers. Only lost one case in my career but was exhausted from the stress and going under financially. One day I burned all my reports to erase my memory of them forever. Integrity is a lonely road on a tightrope that few can walk, but thank you for your continued efforts even though it may come to nothing as the truth remains that no one wants to know as long as they get what they want. You are not alone. Keep up the good fight and stand your ground. 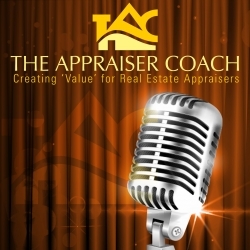 We all have “Those” appraisers in our individual areas that make it difficult to almost impossible for each of us. We are the Gate Keepers for the Consumer and the Tax Payers who will once again have to bail Big Banks out in the next crash. Maybe, just maybe, if we continue to stand our ground, we can prove Gresham’s Dynamic to be wrong if only in regards to professional real estate appraisers. Very well articulated – thanking you for taking the time to write this. These days are challenging indeed for those of us that stand by our principles. The biggest challenges in my market seem to come from appraising new construction and the “comps” the builders try and get you to use. Especially precarious in a non-disclosure state like Texas when the builders don’t want to share the information on the MLS or provide HUD statements in a timely manner. Many good appraisers have left mortgage origination work for this reason. Sad, but true. Thanks for keeping it real Mark. It’s easy for the public to think there is no pressure any longer because of Dodd-Frank, but that’s simply not true. I get it when there is a legitimate need to ask an appraiser to reconsider the value, but in so many cases there is no real substance to the new “comps” the appraiser is asked to consider.